These pages are filled with photos, histories, documents and miscellaneous items of Jones county families. Many of the photographs have unidentified people in them and you are invited to fill in the blanks. Benjamin F. Harrison of Jones county, son of William Harrison and Rebecca Keys, enlisted in the Iowa 9th Infantry, Company B, as a musician on 12 August 1861. These are some of his letters to his parents. They offer a poignant view of the thoughts and feelings of an ordinary Iowa farm boy and soldier. 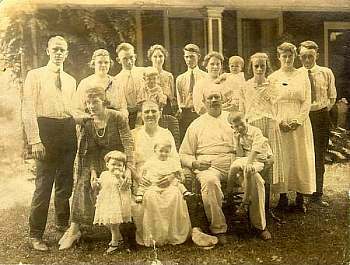 Standing; Ernest Benjamin Harrison, Mildred Harrison, Ralph Harrison holding son Robert, Florence Weaver Harrison (Ralph's wife), Lourn Templin, Maisie Harrison Templin holding son Ralph, Marian Harrison, Beula Marguerite Harrison Ballou, Earl Ballou. Front: Pauline Basner Harrison (Ernest's wife) tending to daughter Lione, Leona Levisa Walbridge Harrison holding Benjamin (Ernest & Paulines's son) Ernest Wyant Harrison holding Ernest (Lourn and Maisie's son). The information in the Family Pages is organized according to the following surnames, but there are many more family names mentioned. 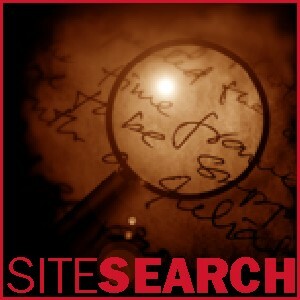 Use the search engine to the left to find the name you are looking for. Houstman by Ron Siebels, 2006. Anamosa Public Library, Olin Historical Museum. Siebels by Ron Siebels, 2005, Anamosa Public Library, Monticello Public Library.